Thanks to the magic of following and unfollowing, every Twitter user can tweak and adjust their feed until it delivers exactly what they want. Looking for breaking news? Product recommendations? Cat GIFs? Twitter’s the place to find the latest and greatest. What that means for marketers is that there as many ways to use Twitter as there are brands (and people) using it. What is Twitter marketing? It’s what you want it to be. Want to learn more about your customers? Make your brand a little more human? Build buzz about your new product? Make an influencer’s day? Provide lightning-fast customer support? Start mopping up after a PR disaster? Publicly humiliate trolls? Twitter’s got you covered. Whatever your marketing goals, there’s no question Twitter can be a powerful tool to help you achieve them. But you might not be sure where to start—or if you’ve already started, maybe you’re having trouble tying your Twitter strategy to your larger business objectives. So whether you’re looking for a few strategic pointers or a start-to-finish guide to Twitter marketing strategy, you’ve come to the right place. Let’s get started. Twitter is a core social network for research, engagement, and awareness. If you’re not working it into your content strategy yet, you can be sure your competitors are. For more stats like these, check out our long list of Twitter statistics all social media marketers should know. With objectives and goals in place, remember to take time to benchmark the current state of your team’s performance. This will help you measure your progress toward your goals, proving that your strategy is producing real, measurable results for your business. Defining and measuring success on social media can be challenging, so taking the time to do this right will really set you apart. Our guide to the ROI of social media breaks down the process for you. And when you’re ready to seriously impress your executive leadership team, check out 4 ROI formulas that will help earn you a promotion. Now that you know what you’re aiming to achieve, you might be tempted to skip this section on strategy and jump ahead to the exciting bits about how to craft the perfect tweet. Don’t do it! A well-crafted strategy is the foundation for your success on Twitter—and it’s what separates the most effective brands on Twitter from the also-rans. Without a clear, documented strategy, you and your team will waste time and money tweeting and retweeting without a clear understanding of how your activities are helping your organization meet its goals. And when it comes time to review your performance and budget, you’ll struggle to demonstrate what you’ve achieved—let alone make a compelling case for increasing your team size or budget. Gathering information about your competitors’ strengths and weaknesses on social is critical. Not sure where to start? Read our quick guide, and then use this competitive analysis template to design a social marketing strategy that will leave your competitors in the dust. Your brand can’t be all things to all people on Twitter—nor should you want it to be. Know who you’re targeting and craft a strategy that focuses on delivering real value to them. This will encourage them to engage with your brand and eventually become customers and advocates. While you’re at it, check out our guide on how to attract and engage more Twitter followers. Depending on the size of your company and your goals, you may want to use a single Twitter account or multiple accounts for different departments or functions. If multiple people in your organization are already using Twitter, auditing and consolidating existing accounts is key. How important is this? When the Vancouver Canucks hockey team deleted rogue accounts and launched official social media channels as part of their social strategy, they were able to strategically grow their Twitter fan base by 800 percent. Teams working in large (or growing) organizations can find themselves working in silos. If you find this happening to your social marketing team, make sure you keep tearing down those silos and stay connected to other teams. Their work can be a rich source of great information and assets to share with your followers—and they may be actively gathering insights that can open up new opportunities for your Twitter strategy. While it’s possible—and easy—to post the same content to multiple social networks, cross-posting isn’t an approach we recommend. Each network has its own unique characteristics and user base, so while applying the same strategy to multiple networks might seem like a shortcut, it might cost you more in engagement and authenticity than it saves you in time and effort. Nail your strategy on one network at a time, keeping it unique and fresh. For a head start charting your strategy, download our social media templates that cover everything from social media strategy and audits to content calendars and bulk message uploading for Hootsuite. Twitter’s website and apps are great for sending the occasional tweet or direct message—but to manage your Twitter marketing at scale, you need the right tools for the job. Generate leads by learning more about the people engaging with your brand, why they’re sharing your content, and who they’re sharing it with. Find industry influencers to connect with. Analyze your competition to find detailed information on their tweets, mentions, hashtags, followers, and more. Find trending topics by content, hashtags, search terms, sources, and more. Edit and add images to your tweets. Manage who you follow (and unfollow) to add valuable new information to your Twitter feed—and remove inactive and spammy followers. Time your posts for maximum impact with tools that analyze both your tweets and your followers’ tweets. With your Twitter toolbox stocked and ready, it’s time to turn your attention to crafting a world-class profile. Twitter lets you use a few more characters in your bio than in your tweets (160, compared to 140), but you’ll still want to get maximum impact from every word (and hashtag). Whether you’re writing writing a new bio from scratch or looking to freshen up an existing one, we’ve got a list of world-class Twitter bio ideas to increase your follower count. A strategically optimized Twitter profile can do far more than just share your name, handle, and description. With a few quick tweaks, you can boost the visual impact of your profile; target a precise physical location or general area; help customers find other Twitter profiles your company manages; and make it easier for people to interact with your brand and start conversations about your products. For all the details, see our video on optimizing your profile settings on Twitter. When people see that you are verified by Twitter, they know that they can trust your content—and your brand. Learn how to get verified on Twitter and earn that small but highly valuable blue “verified” checkmark next to your account name. Of course, after investing all this work in crafting a great profile, you’ll want to make sure people actually find it. Add your Twitter handle to your website, email signatures, the side of your delivery truck, and wherever else it makes sense to show it off. If your strategy is focused on using Twitter to broadcast content to your followers, you’re not taking advantage of Twitter’s massive potential as a platform for social listening. You need to know what your Twitter community is talking about, whether people are directly mentioning your brand or not. What topics are they interested in? What kinds of content do they respond to? Who do they engage with? These are all important factors to consider when participating in social media listening. Another key reason to listen on social is to find influencers and experts in your field. Nearly 40 percent of Twitter users say they’ve made a purchase as a direct result of a tweet from an influencer, and 49 percent say they rely on influencers when looking for product recommendations. For more information on how to find influencers on Twitter and build valuable relationships with them, take a look at our complete guide to influencer marketing on social media. Twitter Advanced Search lets you narrow down your searches, search by negative or positive sentiment, explore relevant hashtags, and much more. For more information, see our guide on how to use Twitter’s Advanced Search for lead generation. Hootsuite makes it easy to set up streams that allow you to not only monitor conversations and keywords, but respond or assign the response to someone else on your team. And with Hootsuite Insights, you can monitor social media networks, news sources, and blogs to stay on top of trends, understand the conversations happening around your brand, and discover which content is resonating with your audience. TweetReach offers basic listening tools, and helps you monitor tweets about your brand, and industry conversations. While it’s true that you’ve only got 140 characters to worry about at a time, you should still strive to write tweets that are on brand, easy to read, and likely to resonate with your audience. If you’re looking for help or inspiration, check out our great list of 8 writing resources for non-writers. To create content your audience will actually read and use, it helps to never stop learning about their interests, needs, and fears. In addition to reading their tweets and engaging directly with them, you can also use apps like Trendspottr to find and share trending content. Yes, the limit is 140 characters—but you don’t have to use all those characters every time to create a great tweet. Mix up the length of tweets, and remember to use a URL shortener (like Ow.ly, available in the Hootsuite dashboard) to prevent links from taking up more space than necessary (and make it easier to include UTM parameters without creating clutter). You curate content when you sort through the massive amount of content online and share the best of it with your followers in an organized, meaningful way. At Hootsuite, we share the best content we find with our followers using the hashtag #ChoiceContent. For tips on incorporating content curation into your overall strategy, see our guide to using curated content on Twitter. Hashtags ensure that your content is being seen by as many followers as possible. Hashtags enable you to classify content so that your tweets are grouped with other relevant Twitter content. This helps other Twitter users find your content easily, just as it can help you find influencers and others in your industry. The art and science of using hashtags has evolved substantially in the past few years, and if you don’t know what you’re doing, you can wind up using hashtags incorrectly and sounding tone-deaf or worse. Get up to speed with our comprehensive guide on the do’s and don’ts of how to use hashtags. The popularity—and effectiveness—of multimedia continues its meteoric rise on social media. A survey of Twitter users found that the majority (82 percent) watch video content on Twitter, and that users want to see more videos from celebrities, other users, and brands. Why not offer your followers more of what they’re asking for? According to Wyzowl’s State of Video Marketing 2017 report, 79 percent of consumers would rather watch a video to learn about a product than read text on a page—and 84 percent of consumers have been convinced to make a purchase after watching a brand’s video. You might tweet out videos your organization has created, retweet relevant video content your audience would find valuable, or explore ways to share real-time video on Twitter. Among all the options for sharing images and photos online, don’t forget to share them on Twitter too. Include relevant images to catch the eye of your community and encourage engagement. If you’re sharing photos of people, you can also tag up to 10 people per image, as described in our post on Twitter best practices. Ah, GIFs. With users sharing over 100 million GIFS on Twitter in 2016, they can be a great option for adding some relevant fun to your tweets. If some cheeky animated joy is on-brand for your organization, try out Twitter’s integrated GIF search. And for a wealth of ideas, you can check out our GIF guide for social media marketers. Tweets don’t last. According to Wiselytics, a tweet has a half-life of just 24 minutes and reaches 75 percent of its potential engagement in less than three hours. That means you need to tweet at the right time to reach the most potential followers and maximize engagement. We recommend tweeting at least once a day to attract and engage Twitter followers. Experiment with posting more than that, and then pay attention to how your followers react to find the frequency that works best for you. Research has shown that the best posting times are generally 12 p.m., 5 p.m., and 6 p.m. Consider posting at these times in your initial strategy, then flesh out your schedule as you learn more about what times get the best results with your followers. Use engagement data from Twitter Analytics to adjust your timing once you’ve gathered some data about how followers are engaging with your tweets. Once you know the best times to tweet for optimal engagement, you can use Hootsuite to schedule your tweets, which will save you time and ensure you’re getting the best bang for your buck with each tweet. With Hootsuite, you can schedule your Twitter messages manually or in bulk, and you can even set up Hootsuite to automatically post at optimal times. For more information on exactly how to do this, see our post on scheduling posts through Hootsuite. And if you’re looking for templates for bulk uploads, we’ve got those too. It’s easy for marketers to get obsessed with the number of followers we collect on Twitter. But without engagement, your follower number is just that—a number. From the start, Twitter has been designed to help people connect and engage on a personal level. Use that strength to your advantage and engage daily with your audience. Follow your network—Your followers’ tweets can provide a wealth of information about their interests, needs, preferences, and so on. Follow and learn from them. Respond quickly—According to one social media research study, 42 percent of consumers expect a 60-minute response time on social media. Respond quickly and naturally to customers, as you would in person or over the phone. Retweet, like, and follow—It feels good when people take a moment to retweet and like your tweets or follow you on Twitter. Return the favor and keep your followers happy. Use @mentions and tag people—When you mention followers, influencers, or other brands in a tweet, including an @mention is a nice way to drive a little traffic their way. You can also tag people in photos when it’s appropriate to do so, as covered in our post on Twitter best practices. Ask for a little help—It’s okay to occasionally ask followers to retweet, mention, or like your tweets. Get interactive—Tweet a question and see how your followers respond, or run a Twitter Poll for customer service feedback, quick product or service opinions, and direct social listening opportunities. Keep listening for opportunities and pain points. If you’re looking for a little inspiration on how to kick-start engagement with your Twitter followers, try our 5-day plan for increasing your Twitter engagement. You’ve seen the news about companies mishandling PR disasters on social—but whether you’re monitoring social networks to mitigate major risk or just to keep an eye on overall sentiment about your brand, it’s vital to know what people are saying and sharing on Twitter. Follow your competitors—This one’s easy. Find your competitors on Twitter and follow them to know what they’re sharing—and what people are saying about them. Get organized to listen more effectively—Twitter lists can be a great way to organize the people you follow on Twitter. If you use Hootsuite, you can easily set up streams to listen to your competitors right from your dashboard. 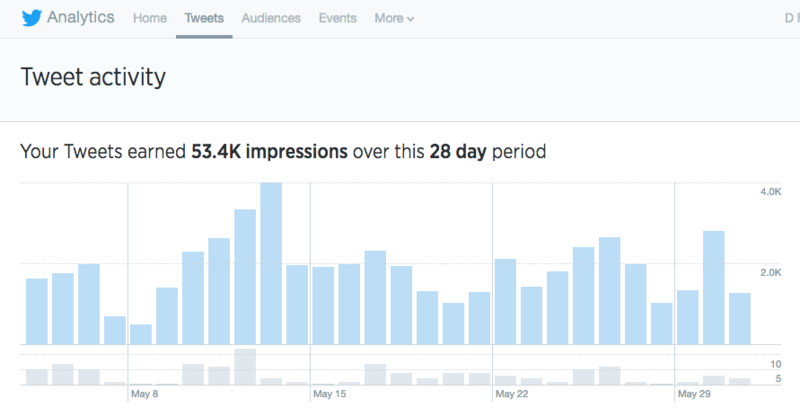 Monitor your brand/company keywords—Twitter Analytics and other tools make it easy to do this. For a more comprehensive approach, you can Hootsuite Insights to monitor social media networks, news sources, and blogs to make sure you stay on top of trending content that matters to you. Have a crisis communications plan—As our CEO Ryan Holmes pointed out in a LinkedIn post on “tone-deaf” brands, companies that haven’t embraced the concept of social listening risk opening themselves up to full-blown PR disasters on social. Learn from their cautionary tales and put a plan in place for crisis communications—and then hope you never need to use it. Twitter Analytics gives you an overview of how your tweets are performing, who is engaging and when, influencers in your network, and metrics for individual tweets. You can track your followers’ activity over time, their interests, demographics, and (if you’re running a Twitter Ads campaign) ad performance. Hootsuite’s analytics tools feature real-time dashboards to help you monitor performance, spot trends, and track engagement across channels. You can tag tweets connected to campaigns or events, then track, analyze, and report on their performance. Now that you’ve mastered the basics, why not try a few more advanced tactics? As great as your social media strategy may be, there are times when it makes sense to supplement your organic efforts with paid advertising to achieve your objectives on Twitter. Depending on the specific goal you’re working toward, you can promote your individual tweets, your account, or even a trend you’d like to amplify and associate with your business. When you’re ready to get started, check out our complete guide to Twitter Ads. Hosting a Twitter chat is a great way to show thought leadership in your field while building advocacy, loyalty, and community. Using a shared hashtag, users meet online to catch up on industry news, discuss issues, and share ideas. To learn more, see our step-by-step guide on how to run a Twitter chat. Here at Hootsuite, we engage with our community through #HootChat, our weekly Twitter chat. We collaborate with influencers in the industry and encourage questions and discussion with our Twitter community. Brands have been sharing live video on Twitter for some time now, and companies like AirBNB are even experimenting with 360° livestreaming channels. Given the exploding popularity of video on social media, adding live video to your Twitter strategy is definitely a promising area to explore. Twitter launched Moments in 2015 as a curated list of the day’s big tweets. In 2016, they opened the tool to everyone on mobile, and marketers have been using it to round up recipes, collaborate with influencers, and even create fan recaps for TV series. From serious to silly, Twitter Moments offer new ways to put Twitter to work for your business. With 67 percent of customers in the U.S. turning to social media for customer service, there’s a very good chance your customers expect to be able to do the same. Whether you use your primary Twitter account or a devoted one for support will depend on the size of your organization and the type of support you offer. You could do worse than to follow the example of our favorite brands leading the way in social customer support. So sorry, Lia. Mind sending us a DM with your contact info and the ingredients you need? Thank you! With rich opportunities for researching your market, engaging with followers, and building your brand, Twitter has come a long way since its 2006 debut as a simple platform for answering the question “What are you doing?” in 140 characters. It’s a powerful platform for building meaningful relationships that will drive the success of your organization—one follower at a time. 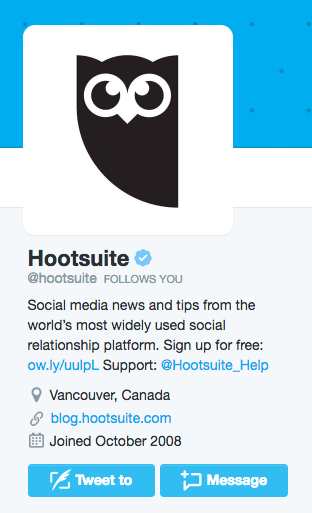 Now that you’ve mastered Twitter marketing basics, Hootsuite can help you put them into action. Try it free today.